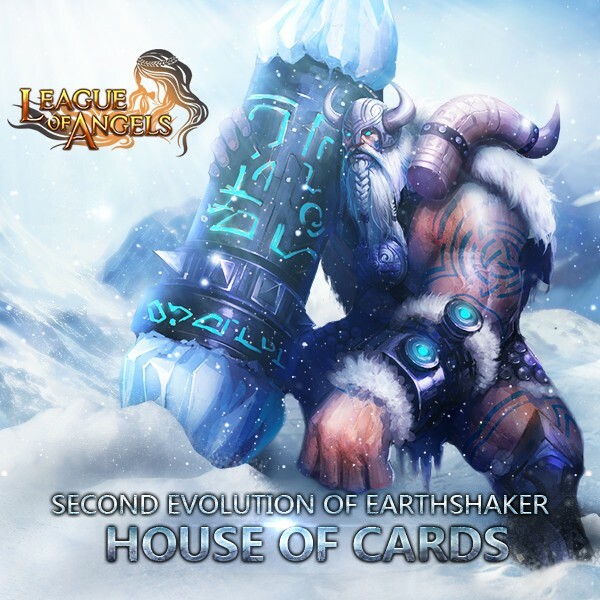 LoA_House of Cards: Make Your Party Strong Enough! - You can swap the required cards for: Moonligt Warlord (Second Evolution of Earthshaker) , Angel Rename Card, Enoch (New Hero), Cedric, Crescent Elf( evolved from Lunar Priestess) , Valentina, Divine Angel, Son of Odin, Mountain God, Lunar Priestess's Icon, Blazing Hecate, Herclues, Hecate, Earthshaker, Messenger of Darkness, Light Envoy, Thunder Lord, Lvl. 10 PATK+Dodge Gem, Lvl. 10 Crit+Hit Gem, Lvl.8 MATK+Dodge Gem, Lvl.8 Dodge+Hit Gem, Lvl.8 HP+PATK Gem, Lvl.8 Crit+Hit Gem, and many more! - Total Ranking Rewards: At the end of the event, the Top 20 players with at least 40,000 total points have a chance to win Runestone, Joker (2), Gem Enhancement Stone, Element Crystal, Lvl. 8/7/6 Fusion Gem Chests. Description: Log in every day to win Lucky Capsule and Card Lotto Voucher! More exciting events are coming up through May 29 to Jun 2(Server Time), check them out in the in-game Hot Events menu now!